Love Island is much like my own love life, not in the sense where I’m surrounded in a Villa of aesthetically pleasing people – I wish – I mean it’s a hotbed of drama, deception and total indifference to other people’s feeling. The opening paragraph may depict me as a total ‘b-word’, ripped right out of the pages of an unapproved Eastenders script, but at least I’m not as morally questionable as some of the folks in ITV’s popular reality show. I’m talking about contestant Georgia Steel (and possibly Jack Fowler). Normally praised by viewers for her undying loyalty to Josh Denzel – and the amicable way she’s dealt with this season’s volatile drama – she apparently frustrated her fans when she lied to Laura Anderson about her date with fellow Islander Jack. Georgia can deny she got a bit too close to Jack but video replay shows she’s not as honest as she makes out to be. That’s right, they’ve finally brought VAR to Love Island! 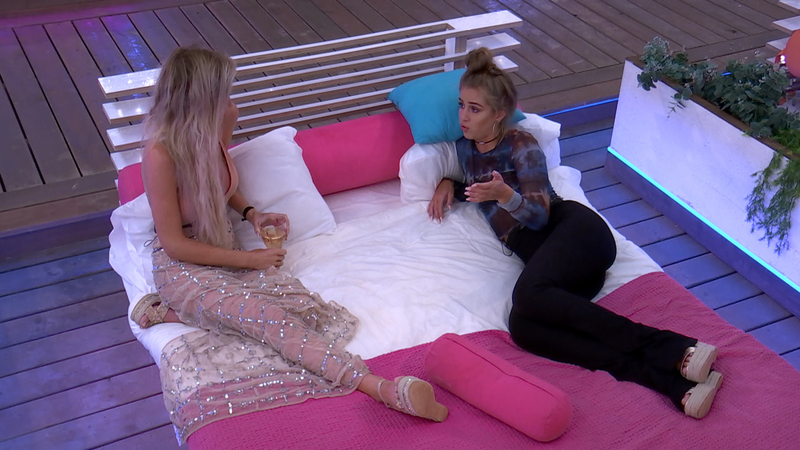 You could say Georgia’s little white lie has prompted those who once championed her, to turn their backs on her after she skipped the opportunity to come clean to Laura and the girls about her date with Jack – who’s spoken for… via Laura. Georgia had the chance to take out two guys of her choice after Josh’s pairing with Kazimir Crossley – which left her on the market – like she was some free agent in the NBA. She ended up choosing Sam Bird – and Laura’s man, Jack. While she tried to do the ‘decent’ thing and tell Laura first, she missed out one tiny detail from her date with Jack. You know nothing major – just the fact she and Jack shared a kiss. Like I said, nothing major… right? Wrong! I guess Georgia thought she could take the secret to her grave, but she must’ve forgotten she’s on a reality TV show where the camera’s are on you constantly. Also, ITV LOVE creating real-life drama for entertainment purposes – has she never watched an episode of The Jeremy Kyle Show? Naturally, Georgia and Jack’s little secret wasn’t kept under wraps for long, and when Laura finally got wind of what happened, she went off like a firecracker. Laura confronted Georgia after hearing from Jack himself how she went in for a kiss – even attempting to lock lips with him a second time after he pulled away. According to Jack, he was sure he offered her a kiss on the cheek, but she pulled his head forward and went all-in for some tonsil hockey. Georgia denied the accusations, claiming she chose to go on a date with Jack because it would be ‘good banter’ with Laura (I can’t believe I just used that phrase). … I said, however my loyalties lie with Laura because she is one of my best friends in this villa. I’m not ever going to jeopardise that ever. I don’t understand why you’ve been touchy with me all night. Maybe it’s because you tried to kiss your best mate’s fella? Best friends don’t normally do that, you know. So you didn’t try and kiss him then?… All you say is you’ve got loyalties. Taking out your best mate’s guy, telling me that it was purely because he made you laugh, then all of a sudden you fancy him, you’ve got a connection and you’re trying to kiss him. Now you’re denying trying to kiss him calling him a liar? After that kiss, you went in for another little kiss and I backed away. If you didn’t feel that or see that, I don’t know why. And they say loyalty is overrated. Love Island airs every night, except Saturday, on ITV2 at 9pm.